I keep seeing increasingly desperate pleas from Facebook page administrators begging me to help them help me see their Facebook updates. Honestly, the only thing more boring than Facebook continually making changes to how and who and when it shows page updates to me is reading complaints about how these changes are so hard on the page administrator. Believe me when I say, more sympathetic I could not be, but at some point it's time to stop complaining and time to start moving on with your social media life. I feel like that best friend who has listened to you complain on and on and on about your bad boyfriend, and now, can listen no longer. At this point, I can only give advice: it's time to break-up with him. Or at least, it's time to see each other a little less. But the obsessing about it? It is definitely time for that to stop. 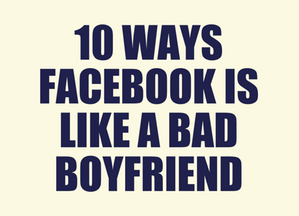 Think I'm wrong in comparing your relationship with Facebook to that of one with a bad boyfriend? I think not. 1. He tells you one thing, but does another. Over and over and over again. 2. He keeps your friends from seeing you - even when your friends have told you (and him) that they want to see you. 3. He thinks your friends are his friends and that he gets to control if, and when, they see you. 4. He threatens that if you want to see your friends ever again you will need to give him money. Lots of money. And not just one time, you will need to pay him over and over again every time you want to see your friends. 5. He creates a ton of drama. You find yourself spending more and more time thinking about what you could do to make him happy. 6. You wonder how you can change to be more like what he wants. You think, "maybe if I use more text and less photos, then he'll like me!" 7. You don't feel good about yourself when you're with him. 9. You let him convince you that if you leave him, there's nothing out there that can replace the void. 10. He lets you think you could never be happy without him. Now tell me, if you wouldn't let a person treat you this way and make you feel this way, why are you letting a social media platform get inside your head? You will be fine without Facebook! To continue the boyfriend analogy, there are plenty of fish in the sea! Facebook is not the only guy in the social media world, find a better boyfriend! I'm serious. Facebook doesn't deserve your time and attention any more than a bad boyfriend does. Start dating Google+, Pinterest, Twitter andspend your time and energy on them, and not on Facebook. And don't forget, living well is the best revenge - and trends show that Facebook will go the way of MySpace, even more quickly once you're gone and not there for Facebook to kick around anymore. I know this is easy for me to write because I don't have a large following on Facebook, but I would like to think I'd still feel this way even with millions of fans. Social media that doesn't play fair isn't worth the fight. Disagree? Let me know in the comments why Facebook *is* like a great boyfriend! I couldn't agree more. I broke up with facebook over a year ago and my life is better without him. It got to the point where I couldn't post anything without someone making a negative comment and I just don't need that in my life! Not to mention the people who only friended me on facebook to be in my business....yuck! It assists lots of people share your "stuff" with their friends until everybody knows your business. Where shares are concerned, there's still nothing that compares. We'll see in a year. Ha! What you've described is emotional abuse. Agreed -- run don't walk to Twitter, G+, Pinterest, Instagram, Tumblr. And put effort into building your own email list for your blog so your readers have a direct line to your content.